The Sherry Netherland – this opulent hotel sits comfortably on the Upper East Side. It is catty corner to Bergdorf Goodman and directly across from Central Park on 59th and Fifth Avenue, making it the ideal location for those of you coming to NYC to shop! Just one block behind and a couple blocks over you’ll find Barney’s on Madison Avenue, and continue walking to find all of the swanky, luxury designer boutiques that also call Madison Ave home. Built in 1927, The Sherry Netherland contains only 50 hotel rooms, all very large for New York’s standards. This is because it was built as a high-end apartment building back in the day, and part of it remains private residences to this day! I stayed here with my mom this May and really enjoyed my stay – it’s a grand old hotel with beautiful decor and details. Dream Downtown – another spot with insanely small rooms is the Dream Downtown, but the hotel is BADASS. I stayed here a few years back. It’s just a block away from Chelsea Market and a few more to a bunch of great shopping in the Meatpacking District. In addition to two great restaurants, the Dream Downtown has a pool and a rooftop terrace/bar. Very fun! The Waldorf – I’ve stayed at the Waldorf on a number of occasions, both in the standard hotel and in the towers. For a truly luxurious experience, book your stay at the towers. Each room is impeccably dressed and the service is outstanding! The Waldorf Astoria guest rooms are definitely nice, but not nearly as large or spectacular as the towers. At the Waldorf, you are walking distance to all the great shopping, but not on a crazy busy street like The Sherry Netherland. It’s a nice escape from the massive crowds around 5th Avenue, while still being super central. NoMo SoHo – I’ve never stayed here, but I had several blogger friends stay at the NoMo SoHo during fashion week and they raved about it! It’s a very chic hotel, featuring modern blue and white bedrooms, great views and a delicious in-house restaurant (which I grabbed lunch at – try the kale Caesar!). The Crosby Hotel – I’ve also never stayed at The Crosby, but I’ve been there for a number of events and meetings over the last several years. It’s a very cool option right in the middle of SoHo. Do you remember The Knightsbridge Hotel I stayed at in London a few years ago? The Crosby is under the same hotel group umbrella, so you know it’s stylish. Jane – it’s been a few years since I’ve eaten at this joint, but it’s a delicious spot for weekend brunch! Try the Vanilla Bean French Toast – it’s one of the most popular items, and for good reason. Jack’s Wife Freda – for a breakfast on the lighter side, this little bistro is an excellent choice. Last time I had the Mediterranean breakfast, but next time I want to try the Rosewater Waffle – sounds right up my alley! Sarabeth’s – if you love eggs, grab a table at Sarabeth’s. So many great omelettes and benedicts to choose from! They are also known for their cookies, breads and other baked goods – they usually serve some for free with your meal! With multiple locations all over Manhattan, there’s likely one right by your hotel. Cafe Cluny – an adorable little spot in the West Village featuring a French-American menu. All of the egg dishes are divine – simple, but perfectly executed and flavorful. This is a favorite amongst New Yorkers! Rosemary’s – to be honest, this spot is fantastic for breakfast, lunch, or dinner. This adorable little Greenwich Village eatery features a fresh Italian menu in a stylish setting. The breakfast dishes are imaginative and the coffee is molto bene. For dinner, try the Marinated Skirt Steak! Lafayette – this brasserie and bakery is another spot I’ve been to on many occasion, and is also great for lunch or dinner! For the most part, the breakfast dishes are light and bright (unless you order one of their fresh croissants or other bakery goods made in-house each day). On a nice day, grab a table outside on the patio! BG Restaurant at Bergdorf Goodman – if you’ve never been to New York, try to make a reservation at BG Restaurant. Housed on the 7th floor of the famed department store, it overlooks Fifth Avenue and Central Park, and features a delightful menu. The decor and furniture is pretty spectacular too! Try the baby kale and brussels sprouts salad and definitely get an order of deviled eggs. Cookshop – this Chelsea breakfast and lunch spot features a menu of sustainable ingredients from local vendors and farmers markets. The Cookshop Lunch Bowl and the Chicken Breast Salad are both delicious and healthy lunch menu options! The Smith – on a chilly day, I love having lunch at The Smith. There’s something very warm and inviting about it, plus the menu has a bunch of hearty options that are perfect for a cold day. They also have a bunch of amazing salads and lighter meals for the healthier eater! Try the Kale and Quinoa Salad, the Cavatelli or the Chicken Paillard. There are several locations in the city, so find the one nearest you! Jeffrey’s Grocery – if you’re craving seafood, this is one of my absolute favorite spots! I’ve been going here for years. The restaurant is small, so you may have to wait a bit for a table, but it’s absolutely worth it! Such a cute spot. Fred’s at Barney’s New York – need to take a break in between shopping the various floors at Barney’s New York? Pop in Fred’s for one of their incredible salads. I can’t pick a favorite – it’s like Sophie’s choice! Ladurée SoHo – I actually have yet to eat a meal at the SoHo location, but I have had lunch a few times at Ladurée in Paris and it is not to be missed. Perfect spot for a civilized ladies lunch or work meeting! By Chloe – for a healthy, vegan meal that is both inventive and delicious, stop in By Chloe for a guac burger and sweet potato fries! They also have a bunch of grab-and-go options for the on-the-go lunch. sweetgreen – for really delicious salads, you can’t beat sweetgreen. Great for a casual lunch during the workday or on the weekend! Balthazar – this French brasserie is an absolute must if you’ve never been to New York. Another fab spot on a cold fall or winter day, Balthazar boasts an extensive menu with options for everyone at the table. Meijin Ramen – on my trip to NYC in May, it was unseasonably cold. Ramen seemed like the ideal lunch the day I arrived, so I walked about twenty blocks from The Sherry Netherland to Mei Jin Ramen. This teeny restaurant features the most flavorful ramen, but also try the Japanese fried chicken as a starter. So random, but so good. The Baccarat Hotel – when the Baccarat Hotel first opened last year, I stopped here for drinks with my friend Patti and we were completely blown away with how beautiful this hotel and the bar were. In keeping with Baccarat’s sought-after crystal pieces, the hotel is decorated as such. With cascading crystal walls, intricate chandeliers and more luxurious details, it’s worth a visit just to see the space. The bar area is very seductive with deep red walls, giant crystal chandeliers and black and white marble floors – the perfect location for pre-dinner drinks on date night! The Carlyle Hotel – if you’re hoping for a true New York experience, you can’t miss Bemelmans Bar at The Carlyle Hotel. This historic hotel bar was named after the writer of the famous Madeline children’s books, Ludwig Bemelmans. The bar features murals by the Ludwig, which remain the only surviving Bemelmans commission open to the public. It’s such a beautiful space! ACME – this is also a great dinner spot, but head downstairs after you grab a bite for drinks! The bar downstairs is always fun and features a young, lively New York crowd. Rolf’s – if you happen to be in the city around the holidays, you have to stop by this restaurant/bar. It is completely covered ceiling to floor in Christmas decorations. It’s wild! Forget Me Not – this one was recommended by my friend Savannah who has been in NYC since we graduated from SMU! It’s a funky little bar for casual after-dinner drinks or a night out with your friends. She also recommends Beverly’s, Clockwork and Blue Ribbon Bar. SoHo House – if you happen to be a member (or know someone who is), it’s always fun to grab drinks or dinner at SoHo House! It’s got great cocktails and a chill but luxurious vibe to it. Catch – for great seafood and a fun atmosphere, get a table at Catch. This is also a great spot for pre-dinner drinks, as Catch has a beautiful outdoor patio with great NYC views! Order the crunchy tuna rice cakes to start (addictive), a few rolls to share for the table, and then one of the tasty fish entrees like the Branzino or the Crispy Whole Snapper. Joe’s Shanghai – for a casual dinner, head over to China Town for the best soup dumplings in New York City! Joe’s Shanghai always has a wait, but I promise the dumplings are worth it. Don’t expect any chic decor or a fine ambiance – it’s a typical Chinese restaurant. Charlie Bird – this tapas-style restaurant is somewhat newer to the scene, but it’s making a splash. I went with some girlfriends for dinner a few months back and we loved literally everything that arrived at our table. The farro salad was at the top of my list! Bouley – for a special occasion or fancy date night, make a reservation at this elegant French eatery. My mom, sister and I dined here last year – they’ve got a tasting menu (which I ordered), or you can order a la carte. Super swanky and delicious! Sort of random, but I really loved the entrance to the restaurant. There’s a wall of real apples right when you walk in the door – so fragrant and pretty! The Dutch – this one’s been around for awhile, but it’s still one of my favorites! A diverse menu and cozy atmosphere make this a great weekend dinner spot with friends. You’ve gotta get some oysters while you’re here – some of the best I’ve had! dell’anima – for a fun date night meal, head to dell’anima. This spot features the freshest pasta in New York – you’ve absolutely got to try the Bolognese. Best I’ve ever tasted! It’s always pretty busy, so go early and put your name down. The Standard Grill – on a nice evening, try to get a table on the pretty patio at The Standard Grill! The menu is a good mix of cuisines, featuring things like oysters, burgers, salads, cured meats and cheeses, and more. The cocktails are really, really yummy here too! I order the Just Say Yes, featuring citrus vodka, basil and lime juice. So refreshing! ABC Cocina – for a delicious tapas-style menu, try to get a res at ABC Cocina. Even the pickiest eater will find something on this extensive menu! The one thing I remember ordering was the gooey spicy ham and cheese fritters, and I remember it because they were so good I ordered a second round… I would also recommend this place for pre-dinner apps and cocktails – go at like 5pm and you’re likely to snag a table right away! Barbuto – I’ve been to Barbuto multiple times and it’s never let me down. Order the insalata di cavolo (kale with pecorino and breadcrumbs – great flavor and texture combo! ), and definitely order a pasta. It’s all made in-house and so yummy! The Smile – fresh ingredients, smart flavor combinations and a quaint, cute atmosphere can be found at The Smile. Try the marinated goat cheese and squash blossom crostini shared plates to start! Milos – I never made it to this place, but my mom ate here with her friends back in May and just RAVED about it. She said it was one of the best meals of her life! She said to order the greek salad (best she’s had) and get the fish (different based on that day’s selection) baked in a sea salt crust (the Milokopi). She said the whole experience was phenomenal! Tamarind – for fantastic Indian food in an elegant setting, try Tamarind. I always order Chicken Tikka Masala, but there was also a spicy cauliflower app we ordered one night – I can’t remember what it was called, but definitely inquire about it if you go! So good! The Lucky Bee – as far as decor goes, this place has nailed it. The Lucky Bee is totally adorable, with a pink chevron bar, pretty parasols, tropical plants and more. The food is great too – find Southeast Asian cuisine featuring steamed pork dumplings, coconut braised beef short ribs, etc. If you love spicy stuff, try the “We Know You Like It Hot”, infused with Thai chili and basil honey! So good. La Sirena – this is Mario Batalli’s latest hot spot, located in the Maritime hotel. In addition to fabulous handmade pastas, you’ve absolutely got to try the cauliflower carbonara. It’s exactly what it sounds like: cooked cauliflower tossed in a creamy carbonara sauce with pancetta. AMAZING. Dominique Ansel Bakery – touristy and there’s almost always a line, but worth the wait. The hype about the infamous Cronut is valid – I finally got to try one on my last trip and it was the most decadent thing I’ve ever eaten. Don’t go here if you’re counting calories! You won’t be able to help yourself. Next time I’m going to try the milk and cookie shots, but those are only served after 3pm! Ladurée – if you don’t go to Paris often (or have never been), you can’t go to New York without stopping for a macaron at Laduree (there’s one on Madison Avenue and one in SoHo). These little delicacies are so light and full of flavor. My fave is rose petal! You can also buy ice cream of the same flavor, and it is so wonderful. Serendipity – another touristy spot, but the frozen hot chocolate they are known for is definitely worth the visit. I personally love the peanut butter frozen hot chocolate the best for a sweet + salty balance. Momofuku Milk Bar – you may have seen me chow down on Momofuku’s cereal milk ice cream on SnapChat on more than one occasion. It’s such an interesting dessert that’s not too sweet. It literally is soft serve ice cream that tastes exactly like milk that’s been sitting in cereal, and then it is topped with corn flake crumbles. So delicious! Momofuku also makes really cool birthday cakes – dying to get one for my birthday someday! Magnolia Bakery – for cupcake lovers, this is the place to go. The location in West Village is the original and the best! Van Leeuwen Ice Cream – the honeycomb ice cream is what made Van Leeuwen famous, and for good reason. It is outrageous! I’ve also tried the cookies and cream, and the fluffernutter flavor of peanut butter and marshmallow. The creamiest ice cream ever! Morgenstern’s Ice Cream – with dozens of unique flavors like burnt honey vanilla, Szechuan peppercorn chocolate, coffee crisp, and more, it’s every foodie’s (and sugar-lover’s) dream. For something extra crazy, try the Black Coconut Ash – never in my life have I seen black ice cream! Big Gay Ice Cream – try the Salty Pimp, made of vanilla soft serve, injected with caramel, and dusted with sea salt. Incredible! Shop: Bergdorf Goodman, Barney’s New York, Madison Avenue for luxury designer boutiques, Meatpacking District for contemporary designer boutiques (definitely stop in Jeffrey! ), SoHo for a little bit of everything, OTTE and Coop & Spree for a good mix of contemporary goodies! Explore: Chelsea Market, Central Park, Top of the Rock, Ice Skating at Central Park or Rockefeller Center during the holidays, Metropolitan Museum of Art, The High Line, 9/11 Memorial and Museum, Eataly, Museum of Modern Art, Brooklyn and Williamsburg (put on your sneakers and walk across the Brooklyn bridge over into Dumbo – makes for an active day of exploring!). next time you absolutely have to try Lavain Bakery. Best cookie you will ever eat- the kind that will haunt you dreams. They are so good my 4 year old said they were worth standing in line for almost half an hour in the June heat for. And she keeps asking whenever we go back into the city if we can have one- we live in Long Island so we go quite regularly but not always to the Upper West Side. 167 West 74th St New York, NY, 10023 We’re heading in tomorrow but into the Village so I’m gonna have to appease her with a Momofuku Birthday Cake Truffle ball, a pretty close second. Great guide though! Thanks for the tip!! I’ve heard of it before, but always forget to go when I get to NYC! Definitely on my list for next time!! New York is always worth a visit! Such a great guide – love! This is an amazing city guide. 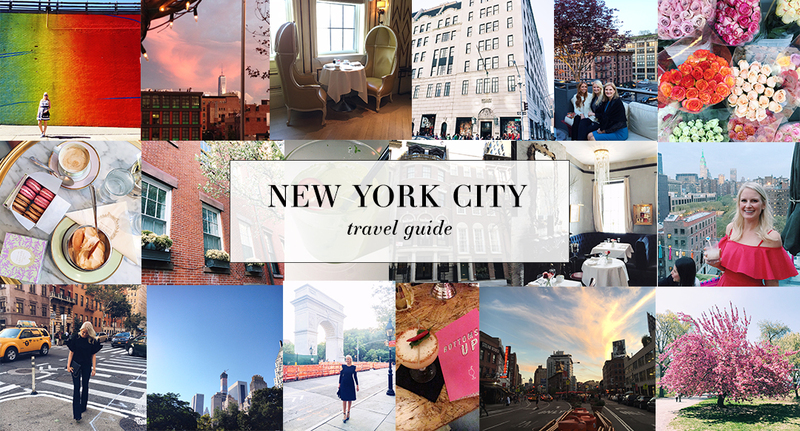 Bookmarking this for my next trip back to NYC! Perfect timing with this post! I’m going back to NYC next weekend for my 30th birthday and definitely needed this recommendations. Thanks for sharing!! I’m so glad! Hope these tips are helpful and you enjoy your bday weekend! Great list. I wanted to add the new Whitney Museum downtown, which has a fantastic collection and 360 degree view from multiple terraces. The museum restaurant, Untitled, is beautifully modern and veggie forward. Also, next door is Santina (under the HighLine) for a fun & wacky lunch/brunch. Can’t wait to try a few of your tips on my next visit.